Tokyo Sushi Academy | What can you learn from Tokyo Sushi Academy? It is more than How to make Sushi ! What can you learn from Tokyo Sushi Academy? It is more than How to make Sushi ! The courses provided by Tokyo Sushi Academy are very various and of course the students too. Some students are retired from their job and trying to enjoy their second life as Sushi master. 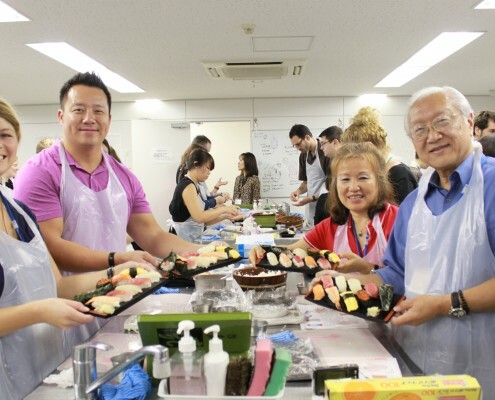 Some students even come from halfway around the world to learn real Sushi making here in Japan. with other students even outside of the school. The other day, we planed a casual drinking party at Okinawa cuisine Izakaya restaurant in Tsukiji. Okinawan unique dishes and drinking Sake . Don’t you think this is amazing!? Also, those interractive events with students are very wonderful opportunity for us, school staffs. We can hear the direct feedback about the curses from the students who are learning in the classes right now. Hearing those feedbacks are actually helping us to make our school better. We belive, even those small things lead the real Japanese food culture spread to all around the world. Well, so if you have any interest in learning Sushi and having a wonderful time with us, don’t hesitate and feel free to contact us! There are various egg dishes such as… It’s Anago Day!